Morena Boschetto attained a degree in oboe in 1995. 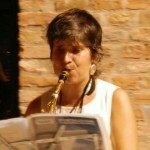 Since then, she has been performing in small wind instruments ensembles and taught in public and private schools in Italy. Currently, she leads adults and children choruses and has experience as band conductor. She is also a composer and has produced several compilations based on mantras from the Vedic tradition. While starting this work without foreseeing a precise result, Morena arrived far beyond her initial expectations. This led her to wish for a stronger involvement with and awareness of the Sound, which she is applying in each phase of the composition. Continuum Movement, thanks to my teachers Simona and Elaine, has helped me to feel. Yes, quite simply, to feel: to recognize that there is intelligence in the body itself. In one’s very Being. There’s a movement, a flow that wants to be recognized for what it is, and that emerges always where there is a need to express a Truth. This sense of possibility, of exchange, of listening without judging or being judged, of joy in discovering the new that wants to express itself … is that particular “sound” that I am always trying to transmit in my compositions, in teaching students of all ages, and in performance.